We've showcased the majestic work of Vietnamese bamboo masters Vo Trong Nghia before - and one of their latest and most striking projects is a restaurant and events center called Bamboo Wing. Situated in the province of Vinh Phuc, the building elegantly combines handcrafting skills with local sustainable materials to create a mysterious environment that is immersed in water. To enter Bamboo Wing, customers walk through a series of stepping-stones surrounded by water and growing bamboo. Entirely made of the fast-growing, renewable plant, the open-air Vietnamese restaurant is airy, cool and shaped like a bird’s wings. The sculptural columns support the angled roof, making a firm statement on how versatile and strong this material can be. Vo Trong Nghia designed the space so visitors could enjoy a meal amid the lush green surroundings while being sheltered by a long curvy bamboo shelter. 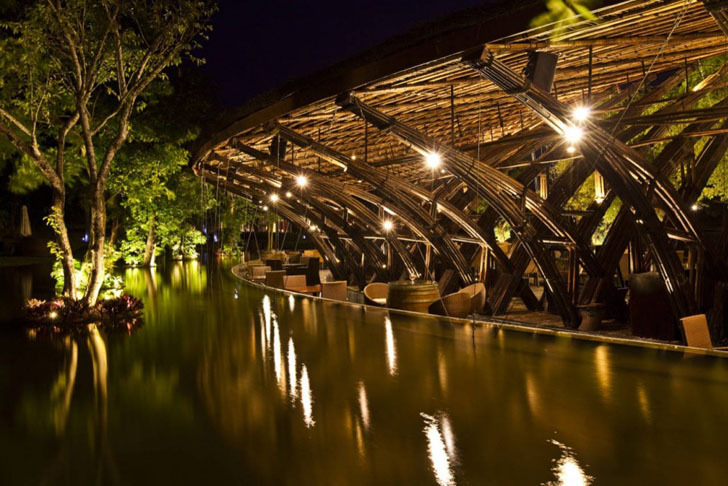 Located in Vinh Phuc province, near the city of Hanoi, the restaurant is shaped like a half-moon and is entirely surrounded by water. Vo Trong Nghia architects work bamboo to perfection, creating streamlined, sustainable and magical shelters that stand in harmony with nature. To enter Bamboo Wing, customers walk through a series of stepping-stones surrounded by water and growing bamboo. Entirely made of the fast-growing, renewable plant, the open-air Vietnamese restaurant is airy, cool, and shaped like a bird's wings. The sculptural columns support the angled roof, making a firm statement on how versatile and strong this material can be. Vo Trong Nghia designed the space so visitors could enjoy a meal amid the lush green surroundings while being sheltered by a long curvy bamboo shelter. 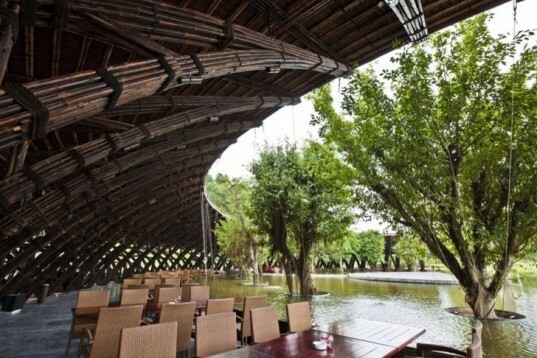 Located in Vinh Phuc province, near the city of Hanoi, the restaurant is shaped like a half moon and is entirely surrounded by water. Vo Trong Nghia architects work bamboo to perfection, creating streamlined, sustainable and magical shelters that stand in harmony with nature.